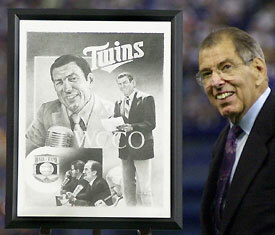 It's Opening Day for the Minnesota Twins and we lost a great one in Herb Carneal on Sunday. 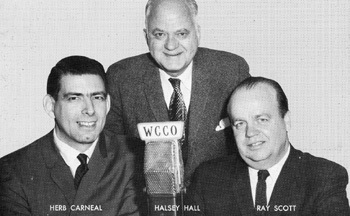 Herb was the voice of the Minnesota Twins since they moved from Washington in 1961. He provided a steady call of the game, seasoned with statistics and an eye for the game honed by watching 162 live games a year for decades. I think what will be lost in all the accolades for this simple man's character and career is that he was what is becoming increasingly scarce in the modern broadcast booth. His broadcast was the exact mirror image of current Vikings play-by-play man Paul Allen who after an interception, puting the Vikings out of the playoffs screamed a 17 second "NOOOOO!". No indeed. Herb did not attempt to compete with the game for your attention, nor did he needlessly fill every second with the sound of his own voice as if doing a remake of the movie Speed, where if he dropped below 50 words per minute, the booth would explode. He merely laid out what was happening on a smooth canvas, and softly illuminated this moving picture in your mind of what was transpiring at the ballpark. What will stick with me is the way signed on every broadcast "Hello again everybody" and signed off "So long everybody". He would always let you know after the first pitch of the game was thrown, that the "first pitch was 7:07pm" so you could properly mark it down in your scorecard. Or the way he would say after a full count foul ball "and the count rides along at 3-2". Yes, we have lost a treasure in Herb Carneal. His voice being as much a part of my summers as backyard barbeques and slow evening convertible rides. So thanks Herbie for providing that background soundtrack of so many wonderful years. You will be missed.